04/27/09: Time Cut Offs: Checkpoint#1 @ Mile 40- 8:00am. Checkpoint #2 @ Mile 151- 7:00pm, Checkpoint #3 @ Mile 217.3- 2:00am Sunday morning, and the Finishline by 2:00pm Sunday. Course Condition Report: After a weekend where rain totals of over 5 inches were reported over different sections of the course, things have changed dramatically. Gravel in the area local to me is very soft and wet. 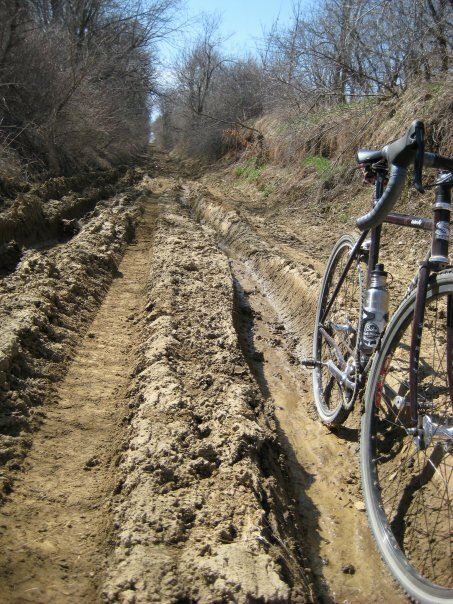 B Roads are, of course, totally mud now. From Guitar Ted’s Blog one of the organizers. April 27, 2009 by Guitar Ted. Anybody Got A Boat? I think it rained harder for longer yesterday than I can remember in a long time. Maybe since 1993 when we had the big floods here. I am seeing that we received well in excess of 4 inches of rain in less than a 24 hour period from Sunday morning till now. (And it hasn’t been raining for several hours!) That’s a month’s worth of rain in a day. Yeah…..go figure that out! Needless to say, I didn’t get in a window of dryness to ride my bike in. Oh well……..
Yes…..You knew I couldn’t end without talking about this! The weather and Trans Iowa. Like peanut butter and jelly, these two go hand in hand. The weather is always a big player in the outcome of this event. Now we have had upwards of five inches or more of rain in two days over parts of the course and you know that some of that will be making for slower going in some places, even without more rain. Trouble is, there are scattered thunderstorms predicted for Iowa on Wednesday and Thursday now. So far, the weekend forecast has flip flopped several times, but is looking to be cool, overcast to partly cloudy, windy……….and dry! From Guitar Ted MTBR post. Oh, and just to tag on to the last post, Trans Iowa Radio, the audioblog I put up live during the event, is a great source of information as to where your riders are at any given time. I don’t usually give specifics, (I don’t list out every indivial rider in the event),but I often call out DNF’s and the leaders position on course. If you have access to cable, it is a great way to find out what is going on, and I will be trying to do more consistent reporting this year to fill your need to know what is going down.